These 3 Food Companies Are Relying on Acquisitions, But Which One Should You Choose? Acquisitions have been growth drivers for these three food companies, but one is better than the rest. Acquisitions are a time-tested recipe for growth in the packaged and ready-to-eat food industry. Innovation also plays a significant role in maintaining relevance with target customers. Let's take a look at how J&J Snack Foods (NASDAQ:JJSF), B&G Foods (NYSE:BGS), and Campbell Soup (NYSE:CPB) have used acquisitions and product innovations as a part of their growth strategy, and which is the best buy of the three. Most of J&J Snack Foods' sales are to consumers at snack bars and food stand locations, restaurants, and schools. The inclement weather affected traffic to these locations in the last quarter. Despite this, the company registered 2% year-over-year growth in net sales during the second quarter of fiscal 2014. However, in the three weeks of April, sales increased a robust 8%, indicating good times ahead. Earnings per share came in at $1.38, presenting a jump of 13% versus the year-ago quarter. The acquisition of New York Pretzel in October 2013 panned out favorably for the company, contributing to sales growth. During the second quarter, it contributed 0.5% in sales to food service customers. For soft pretzel in particular, it added 3% to sales. Soft pretzel performed well in the retail supermarkets segment, registering a 3% increase in sales versus the year-ago quarter. With the cold weather out of the equation, this indicates better times ahead. J&J Snack Foods recently acquired a stake in Philly's Famous Water Ice, the producer of Philly Swirl frozen novelty products. Philly Swirl generates approximately $25 million annually. This will complement the ICEE and frozen beverages portfolio of the company. ICEE is quickly becoming an iconic brand, and it currently has 2.5 million Facebook fans , indicating the strength of the company. ...I'm pressing hard to look for acquisitions, not just anything, not just something it's going to be transformational, but things that we can fit, and we can apply our resources and talents to growing it. On growing organically, through new products, the company came up with new pretzel products such as rolls, sticks, and soft pretzel buns. Sales of soft pretzels to the food services segment increased 7%, excluding the New York Pretzel. So, the company is growing organically also and not just relying on acquisitions for growth. As for Campbell Soup, it is still struggling to wriggle out of a streak of weak performances. Its third-quarter was no different. The company's soup business back home is struggling. Even in winters, when soup sales are expected to increase, Campbell's sales were nothing short of disappointing. Even innovating with new soups and increased promotional frequency did not boost sales. "Despite an increase in the frequency of our promotional activity in the third quarter, we did not realize the anticipated lifts in a challenging consumer environment," Chief Executive Denise Morrison said in a statement. Moreover, the sales of the Pepperidge Farm brand were below expectations. The company failed to meet its own guidance on sales, which grew a paltry 1%. As the company is still trying to reinvent itself, full-year sales growth forecast has been slashed to 3%, down from 4% to 5% earlier. In short, acquisitions and innovations haven't yielded the results that Campbell hoped for. On the other hand, B&G Foods posted terrific first-quarter results. Net sales increased 15.7%, or $26.9 million, versus the comparable period last year, to $198.1 million. Pirate's Brands, acquired in July 2013, contributed $20.4 million to the overall increase. Rickland Orchards, acquired in October 2013, contributed $8.6 million, and TrueNorth, acquired in May 2013, contributed $5.8 million to the overall increase. It has recently announced an agreement to acquire Specialty Brands of America and expects the acquisition to close during the second or third quarter of 2014. After being integrated into B&G Foods, the company expects that Specialty Brands will generate approximately $85 million in sales and adjusted EBITDA of approximately $20 million. So, the growth story on the back of acquisitions remains intact. Return on invested capital, or ROIC, is an important measure that indicates whether a company is efficiently allocating capital toward profitable investments. Since all three companies discussed in this piece have allocated capital toward acquisitions, it makes sense to check how much return they have generated in the last five years. Clearly, J&J is the best of the lot as far as return on invested capital is concerned. Its ROIC has increased slightly over the past five years, indicating that the company has acquired the right companies and efficiently integrated them into the business. On the other hand, Campbell's ROIC has taken a solid beating, declining from around 20% five years ago to just 9.17%. 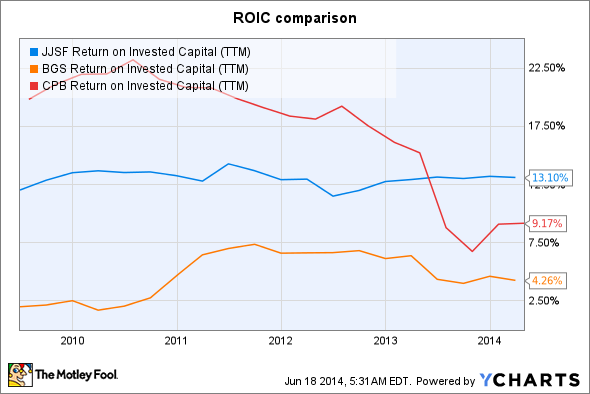 B&G's ROIC growth is also impressive, but on an absolute basis, its ROIC metric is less than a third of J&J's. J&J Snack Foods and B&G Foods have hit gold with their acquisitions, while Campbell hasn't. In addition, the fact that J&J is also focusing on organic growth is impressive, which makes it a solid pick over the other two. J&J is also the cheapest of the three, and this is another reason why investors should consider buying it over the other two.